I have been blessed to be surrounded by wonderful students at bachelors, honours, masters, and PhD levels. I have graduated almost 40 research students and 20 software project groups since I began in academia, and my students have been integral in my own academic development over this time period. Many of my students have co-authored papers with me, have presented with me at international conferences, many have gone on to tutor or to further research in honorary positions or as dedicated research assistants. Nothing makes me prouder "work-wise" than to see my students prosper in their chosen fields and interest areas. The list of companies my students from UOW are now employed in include Google, Facebook, IBM, Accenture, Honeywell, Maquarie Bank, NRMA, Westpac, iTree, Internetrix etc. Some have also gone into government positions including the Defense Signals Directorate and others to local municipal positions for instance in Wollongong Council. And some have even followed their dreams and hit the jackpot with "angel investors" in China. Of course, there are those that are also employed by the University of Wollongong now, Swinburne University, Murdoch University and even universities abroad, like Jordan University-- to these I have a soft spot-- and wish every success with their own sets of students and endeavours in the tertiary education sector at large. Above all, I harness the classic meetings that I had with each, either at Out to Lunch, 67, the Coffee Cart, or my humble office. For some of these students, we recollect lots of laughter, and joy, and hoped the research would never end, for others the times were tough juggling life pressures but never wavering from the final goals. How very proud I am of each and every one of you! Also graduating will be Robert Ogie, who came to SMART in 2014 to work on the PetaJakarta research project. Originally from Nigeria, Robert graduated with a Masters in Information Systems from the University of New England in 2013. His doctorate uses graph theory to enable authorities in coastal megacities of developing nations to more effectively manage infrastructure to mitigate flooding. Assets such as waterways, floodgates, dams, levees and pumping stations form complex systems that individually affect the efficiency of the network as a whole. “The focus for me is about disasters,” Dr Ogie said. “Right now, I am working on a project with the SES and the Multicultural Community Council of the Illawarra to improve disaster communication,” he said. “Even people whose first language is English can struggle to understand emergency warnings. Dr Jennifer Heath, worked in multiple positions during her time at the University of Wollongong but none more important than her role as Director of Student Support and Education Analytics. She was instrumental at instituting Learning Analytics across the campus, and was well known especially in New South Wales universities for her leading stance on ethical guidelines for the acceptable use of learning platforms. Jennifer will be taking up a senior role at Murdoch University as the Director of Strategy, Planning and Performance in March 2017. She will be sorely missed as an integral community member of the Kiama region as well. Thank you Jenn for being such an incredible support to me at UOW- especially during the birth of number 3- that blue baby wrap kept J so cuddly and warm. Dr Roba Abbas is an Honorary Fellow with the Faculty of Engineering and Information Sciences at the University of Wollongong, Australia. She completed her Australian Research Council (ARC)-funded Doctor of Philosophy on the topic of Location-Based Services Regulation in 2012, earning special commendations for her thesis titled Location-Based Services Regulation in Australia: A Socio-Technical Approach. Abbas also graduated with first class Honours and Distinction in Information and Communication Technology (majoring in Business Information Systems) from the University of Wollongong Australia in 2006, earning a place on the Faculty of Informatics Dean's Merit List. She has a strong interest in socio-technical theory, social media, and location-enabled technologies. Abbas has co-edited the Privacy and Security Issues in Social Networks section in the Encyclopedia of Social Network Analysis and Mining, and has previously co-edited a special issue in Cases on Information Technology on the Social Implications of Emerging Technologies. Abbas has written numerous papers most recently for Computer Law and Security Review and IT and People. She has also lectured and tutored in ICT, and has over five years industry experience in product management and enterprise information architecture. Dr. Anas Aloudat is an Associate Professor, at the College of Computer Information Technology, the American University in the Emirates. Dr. Anas holds a PhD in Information Systems and Technology, from the University of Wollongong, NSW, Australia, 2011; a Master of Science in Computing, from the University of Technology, Sydney, NSW, Australia, 2003, and a Bachelor of Science in Computing, from Mu’tah University in Karak, Jordan 1993. Dr. Anas has previously been employed as an Associate Lecturer at the University of Wollongong, NSW, Australia, and as Associate Professor at the University of Jordan, Amman, Jordan. He has published extensively in various journals, book chapters and conference proceedings. His research interests include Government informatics, the social implications of the emerging technologies, national security and emergency management, as well as research related to social media, big data, biometrics and location-based services. Dr. Anas serves as a reviewer for several international journals and conferences. He has also served as a consultant for several organizations and leading consultancy companies in Jordan and in Yemen, on IST business solutions, information management, business intelligence and quality issues in higher education. Anas completed his PhD in 2011 on the topic of location-based emergency management. Dr Sargent completed his PhD at Sydney University. I was fortunate to meet him in my first ever class in IACT406 electronic commerce in 2002, where I was the lecturer and subject coordinator. Jason's first assessment task was that good, that it was published in a text edited by the wonderful late Professor Elaine Lawrence. Jason did his honours thesis with me on one of the most innovative projects I've ever had the pleasure of supervising- long before most in the humanitarian sector were thinking this way: "Digital Aid Frameworks". Jason wears his heart on his sleeve and it has brought me so much joy to watch him develop as one of Australia's finest academics in the social impact of technology space. A successful NCP Colombo Plan applicant, Jason has travelled far and wide, no dearer to him than his beloved India. Check him out on @digidogood on Twitter. Swinburne University of Technology students are moving beyond the classroom and applying their IT and business skills to help remote tribal communities in India connect with the rest of the world. The IT for Social Impact India Project links students with community groups in Mumbai and villages including Pal and Jamnya to explore ways of providing positive social impact through technology. Passionate about making a positive change, lecturer in information systems, Dr Jason Sargent, has accompanied students on two trips to India since the program started in 2014. “I’ve had the privilege of seeing first-hand how this trip changes our students. They are making a difference and in the end they come away with a profound learning experience,” says Dr Sargent. Dr Sargent won the first ever Best Staff Mobility Experience award for Swinburne’s IT for Social Impact India study tour, a project that helped improve access to technology for communities and school children in India. The award recognises the impact of international mobility experiences on the personal lives and achievements of both staff and students. It also celebrates the dedication and effort that goes into developing these life-changing experiences. “To be recognised by international peers who design and support short-term mobility student projects is a huge honour I accept on behalf of my students who journey through India with me and colleagues who have supported me,” says information systems lecturer, Dr Sargent. June 2018: from left to right (the legendary Professor Chris Cook my brilliant Executive Dean who retired in Dec 2018; Albert Kun Yang my incredible student from Nanjing and myself at the Duck Pond lawn of the University of Wollongong, NSW, Australia). Mr Yang’s Masters by Research was on the www.petajakarta.org project and I was so proud he somehow finished altogether dealing with Angel investors for his new gaming VR arcade venture. Albert Yang is a wonderful young man who contributed to the www.petajakarta.org project led by Tomas Holderness and Etienne Turpin. Albert was supervised by Tomas, Etienne and myself and his work was showcased by various emergency management organisations in Indonesia during monsoon periods. Albert's work away from his studies have taken him into Virtual Reality and Location-Based Services Content Management. Most recently he has received two rounds of Angel Investment and is working consistently towards the creation of a VR specialist company. >>What’s the first impression he gave you? Albert and I had been communicating via LinkedIn for about 6 months before we met in person in Wollongong, Australia. Initially Albert wanted to do research on radiofrequency identification (RFID). And then as we considered the most suitable project for him, we teamed up with researchers from the SMART Infrastructure Facility https://smart.uow.edu.au/index.html at UOW and started him working on the http://www.petajakarta.org project. Albert was always respectful, intelligent, and full of energy, eager to start working on a real project. He is a very likable young man with many wonderful traits. >>Do you think he was crazy to drop out? Have you persuaded him to stay? Albert has not dropped out of his degree but is on leave of absence following significant business opportunities which have taken priority. I have persuaded him to finish his Masters by Research degree in the School of Computing and Information Technology at the University of Wollongong, as he has done so much work on his thesis, written over 100 pages of his thesis, conducted all the analysis to the experiments, and has been an important member of the PetaJakarta team. But at the same time we have held many meetings about following one's dreams. We kept talking about what I had learnt from my mentors and felt happy to be passing on the learnings. In all things in life, we are confronted with many options and which to choose is sometimes very difficult to determine. Having worked for a telecommunications company myself before I began in academia, I advised Albert that timing is everything and the concept of first-mover advantage in this industry is paramount in different markets for different reasons. He saw an opportunity, worked very hard for a long period of time after hours to bring it to fruition, and now deserves to reap the benefits from it. >>He said he is a self-centered guy, do you think so? No, Albert always thinks about everyone else but himself. He really is a team player. He'd always mention to me, "my work friends and I want to do this or that", it was never "I" or "me". That is when I knew for certain his heart was in the right place. He has the genuine qualities of a leader. I look forward to continue seeing him grow. Before every step of his research or work life, he would say: "Katina, I want to show you where we are up to now"... sometimes it takes just one person to believe in what you are doing, and the rest takes its own momentum. >>Is he a talented student or a diligent one? Could you give me some example? Albert is talented and diligent. Within a few weeks Albert was programming in Python and within 6 months his visualisation work was being used by emergency service organisations and government agencies in Jakarta, Indonesia to confirm flood reports. Albert taught himself a lot of key programming and database concepts while enrolled in several other subjects, and works so hard toward fulfilling goals. He never gives up and validates his outcomes, for example comparing the implementation of two formulas that should give the same result but do not. >>What character do you think he is? His merits and faults are ? Albert is dynamic, a lifetime learner, he has a great sense of humour and is human to the core. I've never heard Albert say a bad word about anyone, and just wants to make his parents proud and give back to them. He is friendly, and so respectful. And most of all he is a thinker and analyser. He enjoyed much the challenge of reconciling both Chinese and Australian cultures, and in a short period of time, was able to call Australia home. I hope we have him back for good at some time in the future with the full knowledge however that China mainland has a wealth of opportunity given the population, and homegrown talent pool. >>Would you like to share one thing that impressed you most? Oh where do I begin? A myriad of examples, and each week I was fortunate to meet with Albert over 18 months, I was impressed by different things. What impressed me most? Albert is a mature young entrepreneur and innovator who loves learning and loves life and always strives for excellence in anything he does. We are all so proud of him at UOW! Sherien Khachiche, is a 2011 graduand from the University of Wollongong, Australia. 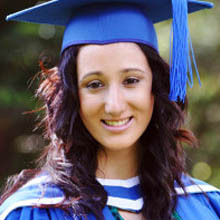 She completed a Bachelor of Information and Communication Technology Honours, majoring in E‐ business Management. Supervised by Dr. Katina Michael, her Honours thesis topic was “The Business Ethics of Online Social Networking in Human Resource Management Practices; recruiting and retaining employees in Australia”. Presenting at her first conference, Sherien’s research strength and focus is business ethics and their contribution to social media use in organisations. Her research thesis on the privacy and legal issues surrounding the use of social media sites such as Facebook in the human resource management processes of recruiting, retaining and terminating employees. She is working towards completing her Master of Project Management – Master of International Business, and will be commencing her Doctor of Philosophy in 2014. She currently holds the position of Domestic Admissions Officer with UniAdvice at the University of Wollongong, ITC Limited. Privy to this she was a Customer Service Assistance in the Coles Group. Together, she also holds 8 ongoing years of customer service experience. Throughout her education, Sherien has also completed an internship with IBM Australia and has worked as a volunteer member for the Kidz Wish Foundation Australia. Sherien was the Director of Recruitment Marketing, Communications and Publications at Nova Southeastern University in 2017, adding to her experience at the University of Wollongong Enterprises where she was first a Domestic Admissions Officer and then Marketing, Recruitment and Communications Coordinator. Laura Perusco has been the Communications Manager for Telltale Games now for some years. She has commented on dozens of international news stories regarding Telltale games and releases. For more search through these pages here. A recent story is included below. Laura was an extremely talented creative writer, and merged her IT skills with these talents. We wrote lots of papers together, and Laura even presented one of these solo in Beijing, China. Minecraft is a phenomenon that has captured the imaginations of millions and millions of people around the world, while Telltale have become well known for bringing a distinctive form of branching, decision-led story telling to their adventure games. Minecraft: Story Mode brings those two things together today – and you can read our review here. To tell the truth, it’s not a property that most people would have expected Telltale to adapt, and so as we sat down with Laura Perusco, Creative Communications Manager at Telltale Games, we asked her about just that. TSA: I think it took a lot of people by surprise when it came out that you were working on Minecraft: Story mode. It’s not the most obvious of franchise to adapt into a Telltale game, is it? Laura Perusco: So, it’s the idea of doing a videogame set in the world of another videogame. We were already working on Tales from the Borderlands, which is set in Gearbox Software’s Borderlands universe, and when we were working on that we started thinking about other videogames that would be suitable for this and, you know, there were people in the office who play Minecraft and people with kids that play Minecraft, and we obviously know it’s this huge phenomenon. TSA: I feel like you’ve got some common ground in creating a story within a game that’s all about creation with The Lego Movie. Do you feel that as well in the studio? Laura: I absolutely see commonalities between the two, yeah, because Lego is also something that you use to create stuff but it didn’t have a story of its own. It is quite interesting to see the direction that you’ve taken with the story, because it very much is a Telltale game with action, characters with friendships and conflict, and it’s interesting that you’ve gone for that instead of maybe a more traditional point and click adventure or something with more Minecraft-style crafting. Laura: So, at Telltale, we’re all about playable stories, that’s what we do. We want our stuff to feel like a playable movie or a playable TV show, and we really wanted this to be an all-ages adventure, something that families could sit on the couch and play together and talk about. You might have noticed that there are some slightly more puzzle-y elements than what we’ve been doing recently, like at the [end of this episode], but whatever license we’re working on, we try to make sure the gameplay, the mechanics, the level of the action, and the level of the puzzles fits what that license is about. Laura: Yeah, we absolutely had to have crafting and building and that kind of stuff. That’s what Minecraft is, and that’s what people love about it! We want it to feel like Minecraft, absolutely. TSA: But how do you decide to draw the line between the two sides? You craft items here, but you’re not able to actually build something out of blocks, for example. We’re not trying to reinvent Minecraft, what we’re doing is a story set in Minecraft’s world, so adding elements of crafting and building where it fits in that story is what we’re trying to do. TSA: You do have a lot of fun little ideas and jokes in there, so for example, from the Minecraft side of things you have references like the minecarts scene, but I also quite enjoyed that you could seemingly go through the entire story with Jesse as a silent protagonist. Laura: Yeah, and that’s possible in all of the Telltale stories with silence as an option, and it is always an option. TSA: This episode does end with – and obviously, I’m not going to go into the specifics and spoil it – it does end with a rather big decision that’s going to affect the next episode in a big way. I’m curious how you’re going to resolve that in the second episode when it will have you going to completely different areas. We like to have divergent paths as and where it makes sense, and we like to make it feel like your choices matter, whether it’s in how a character ends up reacting to you or where you go and what you do, but we’re telling one particular story here. We’re not doing something that has six different endings where you end up in a completely different place depending on the decisions that you make, so you end up with these divergent paths that meet back up for the important story bits. Laura: But then you end up making all of this content that no-one is going to see! TSA: No! Because with a pick your own adventure novel, you’ve got ten fingers and thumbs, so you’ve got ten checkpoints! Laura: Oh, yeah, I’d always be holding stuff so I could go back. TSA: I really enjoyed the music throughout the episode, and I’m wondering if you can talk about the inspirations behind that? It’s been a long time since I’ve delved into Minecraft even the tiniest bit, so were Anadel working from the music in that game? Laura: Absolutely. So, the background music in Minecraft is all very ambient and it’s composed in that way, whereas for Minecraft: Story Mode, what we want is for the music to be cinematic and have crescendos and different levels, so it’s not ambient all the way through. So that’s something we were aiming for. TSA: It’s quite a different feel in this game! It reminded me of, if you remember it, Everyday Shooter on PS3? TSA: It was a twin stick shooter, but as you shoot enemies, they add notes and tones to the music of the level. It’s so old, it doesn’t even have trophies, but it was really good! Laura: Oh cool! That sounds awesome. Laura: [laughs] Uh, no. This is what it is. There are some things that don’t exist in the base Minecraft. Things like, you know, depth of field changes to make it look more cinematic, because this is the language of cinema, it’s not open-world sandbox. But yes, this is the way the game is going to look! We actually modelled a lot of the environments in actual Minecraft first and then exported them into the Telltale engine, to make sure everything feels absolutely, unequivocally Minecraft. Then we added a little bit of spice on top of that. Cooper Lees completed several subjects under my supervision and that of MG Michael. The subjects covered citizen rights (including Privacy) and ethics, and security and risk fundamentals. He was a committed student, deep thinker, and always asked challenging questions. Very proud of my PhD student, now Dr Jennifer Heath for her Runner Up performance in 2011's UOW 3 minute thesis competition. Jennifer went on to finish her PhD in record time, with full-time work and study commitments. Dr Roba Abbas is interviewed by ABC Science Online here. In the pilot study, participants were interviewed after a period of carrying the GPS devices with them wherever they went, keeping a manual diary of their location and observing the difference. In some cases, people thought tracking technology could be useful for providing evidence to a partner on their whereabouts. "Today I was supposed to finish work at 9, but being Easter I didn't get out until 10. When I got to my boyfriend's house he questioned me about where I'd been," said one participant. "I was able to say 'check the [device] if you don't believe me'. I then realised that in a situation where you had to prove you had been somewhere, the [device] could be used as evidence." One participant also thought a small version of the device could be used to covertly collect evidence against a potentially guilty partner. But participants became worried when they discovered the loggers were not always accurate, sometimes recording their location a street away from where they actually were. Abbas says they were uneasy about the possibility of inaccurate location information being used against someone. Another participant said, "The [device] has the potential to ruin people's lives because it has the potential to give an incorrect location. For example, if a husband were to track his wife's car, she may have gone shopping, but it's showing the location of the car in the street next to the shopping centre, this could cause many trust issues to arise unnecessarily." Abbas' research has also found concerns about the ability of people to tamper with the tracking technology and "lie" about where they are. I could not have been more proud of my four PhDs presenting at IEEE ISTAS10. I could not have hoped for a more hardworking group of research students. Anas, Roba and Jennifer received their PhDs a few years ago now, and Alex is at the final stages of writing up (he was a few days into his PhD when he presented at ISTAS)! Among the remaining highlights were my two Social Impact of Technology students, Haralambos and Belinda who presented on emerging location based social networking apps. Belinda accompanied me to a lecture delivered by Professor Kevin Warwick at the University of Sydney a few months before ISTAS-- and these third year students could well have gone into research had they not been snapped up by industry. Looking back, I reflect on the professionalism of all my students. It's not often one is blessed to supervise 6 brilliant young men (Rodney Ip is missing from the photo). These young men went onto secure jobs at iTree, Wollongong City Council, IBM, Macquarie Bank, Accenture, and Google. They studied broadly emerging technologies and their theses spanned GPS and in-car navigation systems, RFID in supply chain management, mobile applications and value propositions, RFID security, and RFID implantables from a legal/implications perspective. Many of these students had been prepped for honours by my husband Dr MG Michael. I was fortunate to receive them a year later, after the ground had been prepared. Each of these students I taught in separate cousework as well. It has been wonderful to follow each of them as they have progressed in their workplaces. Highly motivated, very intelligent, and hard workers- I cannot speak highly enough of each of them. What a memorable time that was!